In a random city, in a random hotel, in a random room, a random housekeeper put a Bible out in front of the TV. The verse, “all my Springs Lord are found in You,” caught my eye. I had been studying Psalm 23 and where it says He leads us by still waters. It seemed like an inconsequential verse, I didn’t study it or really make any connections. Later that day our family went shopping at one of the best outlet malls and there was a little bubbling in my soul. I did not purchase one thing although there were many fine temptations. You oh Lord will cause us to be guided and lead along the paths of righteousness. The gentle Shepherd uses many things along our path to guide us where He wants us to be. Psalm 139 suggests that He even plants things in our way to blossom just for our enjoyment. A God of joy, that is different than He is often portrayed. He literally sows things that will come to fruition at just the right time. Although the movies cast shadow on our way, causing us to fear what is just right around the corner, the message of Gods’ sovereignty spreads light that He sees what is up ahead. He guides us not only to safety but in ways that will bring us delight. On the next part of our family get away we chose a hotel that was rated quite high but not a chain hotel. I noticed the butterfly paintings on the wall and it seemed familiar to me. As we swam in the pool I remembered prayers I had prayed for my life back in 2003, prayers for a future family, ministry and God’s will. Other hotels had been built and I had not been back here since then but when I got in that pool I remembered my hearts cry. There I was– 15 years later, soaking in God’s provision, presence and grace. Even when we are unaware of our journey, God takes us along paths of His remembrance. God, you have been so good, answering when I had even forgotten what I asked You. In that pool came a little family, a mom, dad and baby girl. The babies smile spread across her whole face and her giggle was amazing. She was so thrilled by the water and the closeness of her family. When her daddy went to the hot tub her eyes followed him. She was unaware of my boys splashing nearby, unaware of the deep end, unaware of the other people as her eyes were firmly fixed on where her daddy had gone, secure in her mamas arms. It was so beautiful. The gentle Shepherd is aware of the dangers around us but we have no need to help Him, our only task is just to keep our eyes on Him. Lauren Daigles new song, “He’s my everything” comes to mind and I’ve been singing it, reminding myself that He is everything that I need. The word for path in Psalm 23 is ma’gal in Hebrew. I did a skit years ago in church singing “My girl” by the Temptations to remember this verb, talkin bout ma’gal. It does not mean just a pathway to something but points us to the path itself. It is more than a roadway but an entrenchment, a rut. Oh how we resist ruts in our culture but sometimes they are good things – ruts of devotions, ruts of church attendance, ruts of communion. They point us to what is important and keep our feet on level ground, taking us to places that will give us peace rather than injury. Proverbs and Psalms talk often about the traditional way or the paths of peace, the precepts or commands of God’s blessing. 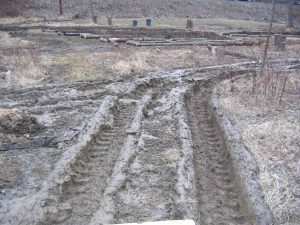 Taking the familiar rut or pathway means your oxen or wagons will stay put rather than careening over a cliff or getting mired in mud. Young people often resist these things or mockingly insist that they want to do things “their way”. While creativity and being unique is wonderful, there is time tested wisdom that yields protection that seasoned Christians know not to miss. The Bible speaks of many paths – Isaiah pointed out making the path straight for Messiah, Romans and the Romans road point us to the salvation of Heavenly Father reaching out to bring His kids home to Heaven. Here the paths refer to the way the Shepherd is taking His sheep – He knows the terrain best. It could also point to a metaphorical path of justice and righteousness, where measurements and evaluations are holy and fair. No matter the swirl of opinion, no matter the votes of popularity, no matter the shouting of the crowd, the Shepherd causes us to be lead along the path that will bring us safely to Him. Human paths are often not just, consider the political atmosphere. Human paths are often not inclusive; consider the division of families, churches and governments. The One who has the government upon His shoulders, reigns from a Heavenly perspective and is justice personified. This is the very same One that guides us on the pathway and brings us into that “rut” of a path, even though we are pulled by our own weights and burdens to lean other ways. This all sounds wonderful but what if this is just for other sheep? You know the white fluffy ones or the black silky ones or the ones with ribbons around their necks? If it isn’t for all, the path wouldn’t be just or righteous would it? John 10 tells us the Shepherd knows His sheep. Tim Tebow is known for his excellence in football and the crowds can count on him pulling through, even at the last minute to win a game. God, has never failed, never lied, never dropped the ball – throughout history. So, David, not a subscriber to cable television and only knowing his success with bears, lions and giants tells us – God leads us in these paths for HIS names sake. After all, His reputation is at stake if He does not guide, lead and bless you. Puts a high premium on Christians fanning the flame of success for other Christians rather than chewing them to death doesn’t it? God’s reputation is on the line and He is competent and capable to lead us. When we stay on those paths we also bless His kingdom – for our lives and for other sheep. Lord, help us! Lord, today we look not to the left or the right but straight up at You. We trust You have our best interest and Your kingdom at heart. You have been good and faithful throughout time and we choose to trust You today, no matter what shadows lurk around us. You know our end from our beginning and our days are in Your hand. Lead us gentle Shepherd. We cast our burdens on You today, not wanting them to sway us off of Your path. Keep us in the narrow Way. You are our everything and give us everything that we need. Thank you Lord Jesus.